Some adaptive rowing programs are oriented toward racing, and use "conventional" equipment that will meet the rules specified by the Adaptive Rowing Commission of the international rowing federation (FISA) and the United States Rowing Association. This disabilities classification system assumes that all rowers have the use of their hands, arms, and shoulders, and the qualifying physical disabilities are in the trunk or legs. But there are people with upper body disabilities (such as hemiplegics, quadriplegics, hand or arm amputees) who do not have the use of their hands, arms or shoulders, and cannot row with conventional oars. They are effectively excluded from adaptive rowing programs that follow the above rules because they cannot use conventional equipment. Many of these severely disabled individuals may not be interested in competitive racing, but do have a need for exercise and recreation that rowing could provide. The FrontRower™ forward-facing rowing system accommodates many upper body disabilities. It can be used by able-bodied and disabled rowers alike, (making it fit in with the concept of "universal design"). The FrontRower™ uses the power of any two limbs to row and steer the boat. For hand, arm or shoulder disabilities, the rower uses his legs. For leg disabilities, the rower uses her arms. Or you can use one arm and one leg. The disabled arm and leg can be on the same side side of the body (hemiplegia), although this requires rerouting one of the leg power ropes. The FrontRower™ also accommodates localized weakness allowing partial use or range of motion in the weak areas. The FrontRower™ has a forward facing position making everything easier and safer and eliminating the need to twist around to see where you are going. The FrontRower™ is designed for use in ordinary canoes. Canoes are more stable than shells and do not require outboard pontoons or stabilizers. This makes them easier to board because there are no overhanging riggers to get in the way. Rowing with a FrontRower™ is great exercise for older people. Many older individuals would like to enjoy being on the water and getting good exercise, but do not have the strength or agility required to use conventional sculling equipment. For many older people, the rear facing position of conventional rowing is a problem. The FrontRower™ eliminates this problem with its forward facing position. 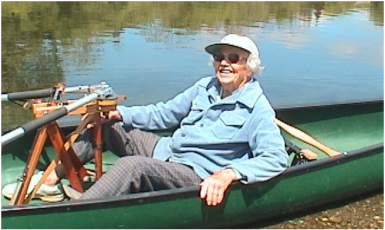 Some elderly people lack the upper body strength required to row conventional equipment. The FrontRower™ overcomes this problem legs only operation. The automatic lifting and feathering features make this very easy. And elders can add as much upper body power as they are able for exercise and range of motion. The FrontRower™ can enable older people new to the sport to take up rowing, and experienced rowers to continue rowing after conventional rowing has become too difficult. Older people appreciate the exercise quality of rowing. Transfer system for adaptive rowing. 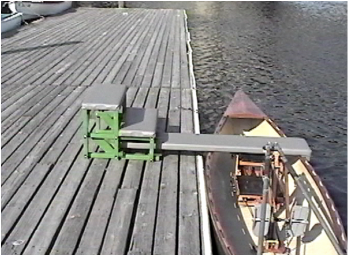 For boarding, the two step riser with transfer board enables many wheelchair bound rowers to board and exit under their own power. The transfer board is attached to the riser and extends out over the gunwales of the boat, stabilizing it during the boarding process. Contact Ron Rantilla for information on the boarding system.